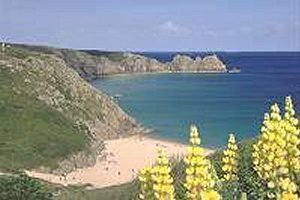 Porthcurno, St. Levan and Treen lie on one of Cornwall's most beautiful coasts and within an area of spectacular granite cliffs and beaches. The surrounding countryside is equally lovely while the area is well served by excellent village shops, pubs and other services. The National Trust owns much of the coast. The Porthcurno valley has had close links with trans-oceanic telecommunications since the last century. The Porthcurno Telegraph Museum is located in the valley and is housed in a secret wartime communications centre within a complex of underground tunnels created to protect Britain's vital communications system during World War II. Between Porthcurno and St. Levan is located the open-air Minack Theatre. Each summer a variety of groups fill the 16-week season with a variety of plays and musicals performed against one of nature's most beautiful scenic backdrops. A short walk from the Logan Inn at Treen lies the famous, rocking Logan Rock - a large rounded boulder perched on top of a high cluster of granite slabs at the heart of the Treryn Dinas headland.